A new non-profit Chinese-language news site called Citizen News launched on January 1, 2017 in Hong Kong. In a time of chaos, we must distinguish right from wrong; when society is restless, we must stick to reason and fairness; inside the storm, we must maintain autonomy with professionalism. The Chinese name of Citizen News carries the word “public” (眾). This is because we believe news must serve and be accountable to the public. We will promote public participation in journalism, including news production and subsidy for operation. The site’s editor-in-chief is Daisy Li Yuet-wah, the former chief executive of the online news division of Taiwan's Apple Daily News. During the press conference for the launch, Li said the site aims to help the public understand the context behind fragmented pieces of news and information circulating online. In addition to in-depth reports and data journalism, the site will cover views from across the political spectrum and subsidize citizen news reporting. The site is run by 10 full-time editors, many of whom have worked in the news industry for three decades, such as Daisy Li Yuet-wah herself; Keung Kwok Yuen, the former executive chief editor of Mingpao Daily; and Chris Yeung, a former political news editor for the South China Morning Post. Former Hong Kong Journalists’ Association chairwoman Mak Yin Ting, who is also a non-executive director of Citizen News, warned in her remarks that Hong Kong's press freedom is eroding and professional journalists must stand up to the challenge. Hong Kong is ranked 69 out of 180 in Reporters Without Borders’ 2016 Press Freedom Index, lagging behind Taiwan, which came in at 51. The city, which is a special administrative region of China with a high degree of autonomy from the mainland, was ranked 18 in 2002 when the index was first launched. The deteriorating media environment is the result of self-censorship in mainstream media outlets and political intervention from Beijing through the management of newsrooms. The plan to subsidize citizen new reporting is to reach out to the community, turning their knowledge and concerns into news stories. As a member of society, citizens’ concerns have news value. […] the proposals will be reviewed by a committee of academics, professional journalists and experts in different fields. The subsidized reports will then be published on the site. Kevin Lau, the former chief editor of Mingpao Daily who survived an attack by two men with a cleaver in 2014, is a non-executive director of the site’s holding company, Civic Journalists Limited, registered as a company limited by guarantee. He explained that the inspiration to create Citizen News came during conversations with friends while he was recovering from the attack in the hospital. After he was discharged, he held a monthly gathering with them to prepare for the new endeavor. Society is inundated with fragmented information. It is necessary to have a platform that aggregates important information from trusted sources. […] The majority of mainstream media is serving the interest of big corporations, and Hong Kong deserves more independent media sites. The site will start crowdfunding for its operation costs. 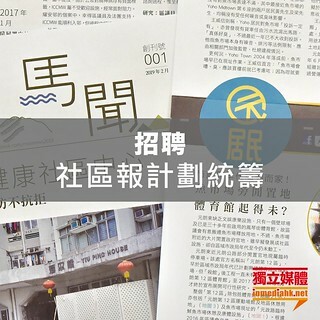 Its annual target is HK 5 million, or approximately US $129,000, which would cover the citizen news subsidizing scheme.